Types of fountain nozzles used in feature design. When designing a fountain jet water feature one of the most important criteria is the choice and use of fountain head nozzles. This article is about some of the most commonly used fountain effects and the type of nozzles used to create them. Fountain heads are used in residential and commercial fountain designs across the world; their origins date back hundreds of years. They offer the scope to create stunning water jets that leap meters high into the air, to more elegant fountains for a low key effect. The use of fountains in garden features or commercial water feature projects will always help to add height, movement and flow to any garden or landscape design. Modern fountains offer a wide variety of choice and allow you to create unique water sculptures that work as either a point of interest or as a back drop to a large landscape. 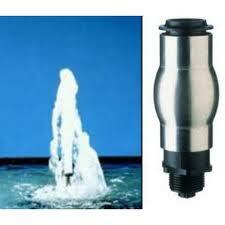 Fountain heads are usually made from plastic, brass and other non corrosive metals. The prices and quality can vary. A positive out come from this is that you can use fountains in small to medium garden designs where the budget is a contributing factor. They still create the stunning effects found in higher end fountain water feature projects without too much compromise. 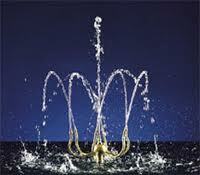 Generally speaking there are four main flows of water created by a fountain head nozzle. 1. Normal traditional flow, this is most easily achieved as it involves pumping water through a fountain attachment without any form of special effect. The visual appearance of this style is just like the flow of water you get from a garden hose or tap. 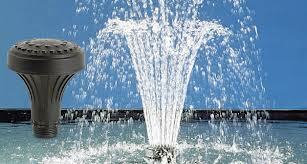 Traditional multi jet nozzles are the most commonly used fountain, they are cost effective and easy to install. They are basically a cylinder with holes in the top varying in size and pattern. They produce a multiple flows at varying heights. Matrix fountain rings are a larger version of the multi jet. 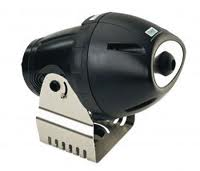 They can be designed to shot water outwards or in wards to a feature. They are made from inter connecting pipe that are feed from a pump and usually have directional finger nozzles attached. 2. White water, this style is becoming more common in today’s water features. The effect is achieved by allowing the intake of air into the water flow before it leaves the end of the fountain head. This gives the water a white frothy appearance. This can be particularly useful if you are using fountain lighting as the water reflects light equally. The two most common fountain heads that use this style are the geyser and foam heads. 3. Laminar flow, this is the newest type of fountain head. The jet of water has a crystal clear glass tube like appearance. The solid tube of water produced does not separate so it can be used to create arks and more defined pieces of fountain design. 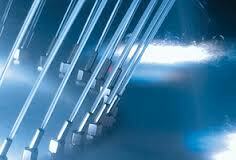 They also allow light particles to move freely inside the water jet. To find out more about what a laminar jet is and what they can do visit my article on laminar jets. 4. Last but not least is the film fountain jet, these jets create a clear film of water obviously. Unlike the other fountains the water is directed to a downward motion either by pumping water onto a smooth curved plate like the bell jet nozzle, other examples are the fan jet and water blade. 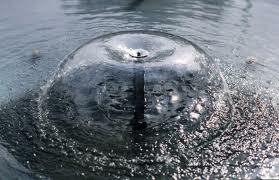 Floating fountains, these are particularly useful for lakes and large water bodies. 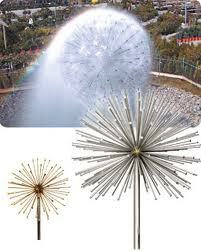 Spheres for large commercial or public water features, they have dandelion or tree like appearance with multiple jets at different angles. Rotating fountain heads, this nozzle spins around as the water jets out of the nozzle. Water curtains, these have only been around for a short time and are less well known but are slowly becoming more common as they become more readily available. They are used in programmed fountain water features and displays.